University of Arkansas Museum photo number 790443. The Beaver Pond Shelter in Crawford County was excavated by Samuel Dellinger’s University of Arkansas Museum crews in 1934. Among the artifacts found in this shelter was this “axe.” This is a perfect example of the kind of information that is available in bluff shelter sites because of the amazing preservation of usually perishable materials. The only part of this tool that would survive in an open archeological site is the stone blade. The hafting elements, the wooden handle, and the cordage wrapped around it would have rotted away over thousands of years in the ground. 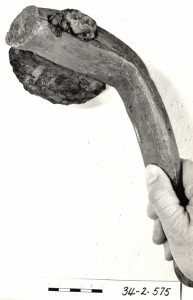 The handle of the tool is a slightly trimmed piece of hickory that appears to have been deliberately bent to the left and twisted to the right. A perpendicular cut mark is noticeable at the point where the bend begins, leaving Dr. David Jurney, who studied the tool in the 1980s as a part of research into siltstone tools in the Ozarks, to conclude that the handle may have been purposely bent by steaming the wood. If only the stone element had been found, archeologists would assume that this was a simple axe designed to chop wood. Both use-wear and the peculiar way the stone tool was hafted point to another function—as either a hand mattock or grubbing tool which would have been used for digging. This is just one example of the kind of information that can be gained when hafted stone tools are found.